John Oliver had a strong message for Donald Trump during his HBO show Sunday night: "drop out" of the race. 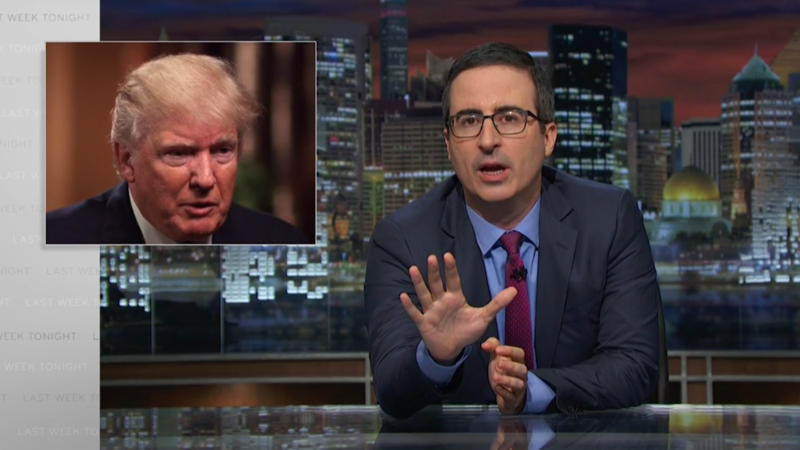 On his "Last Week Tonight", Oliver said Trump had come to a "fork in the road" with the resignation of his campaign manager, Paul Manafort, and that he believed the Republican nominee only had two options. One, either continue with his campaign and potentially lose -- and, he said, a loss would be "disastrous" for Trump's brand or simply end it now. "If you keep going, you're going to spend the next 11 weeks ramping up hatred in speeches, injecting poison into the American bloodstream that will take generations to remove, and denying the country the contest of ideas that a presidential campaign should actually be," he said. "And after that, you're either going to win or you're going to lose, and I think both of those scenarios end pretty badly for you. Which is why, Mr. Trump ... I would like to propose to you a third option. That is, drop out. Simply drop out, and tell America this entire candidacy was a stunt. A satire designed to expose the flaws in the system." Oliver said that even if Trump managed to somehow win the election, he ultimately wouldn't be happy. "Then he actually has to run the country," he said. "That means living in government housing, conversing with fully clothed women, and traveling in a plane that doesn't even have his name on it." Sunday's episode marked the final episode of "Last Week Tonight" before it goes on a month-long hiatus.